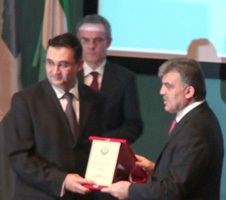 Dr. Savaş Alpay, Director General of SESRIC, was awarded with a Plaque of Gratitude by H.E. Abdullah Gül, Chairman of the COMCEC and President of the Republic of Turkey, on 9 November 2009 at the COMCEC Economic Summit. H.E. Abdullah Gül presented the award for the appreciation of the outstanding accomplishments of H.E. Dr. Savaş Alpay since his appointment as the Director of SESRIC in 2006. The award also honoured the efforts of the SESRIC to put its accumulated experience and acquired know-how at the service of the Organisation of the Islamic Conference and its member countries.